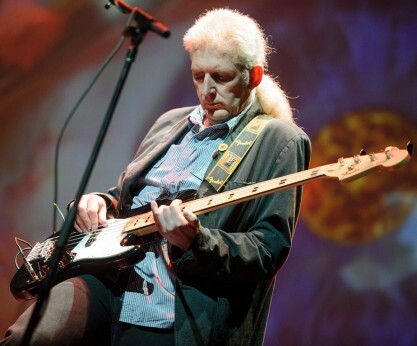 Initially inspired by Rush, or more specifically Geddy Lee, Andy began playing bass while still at school but it was the heady days of the early eighties that introduced him to the world of prog and set him off on the long winding path to Nearfest in 2012. After that he became a Marquee regular, never missing a Twelfth Night show and getting hooked on bands such as Marillion, IQ, Pendragon, etc. Andy played in several bands while at university, including one memorable festival where he performed in both a new wave/punk quartet and a prog covers band on the same stage! Having left uni, Andy formed Walking on Ice, who gigged extensively around the south of England and eventually became the first band signed to the fledgling Cyclops Records, releasing one album “No Margin For Error” in 1994. After seven years of frequent line up changes Walking On Ice eventually split and Andy was asked to join Cyclops label mates Jump. Ten years later and with five studio albums (“Matthew”, “On Impulse”, “Home Songs”, “A Man Was Made”, “Faithful Faithless” ) and one live album (“Something of the Night”) under his belt it was time for a change. An introduction from Clive Nolan led to a meeting with Andy Sears and some work on his solo projects, which in turn led to the offer of the NEARfest gig. “If someone had said to me nearly thirty years ago at the Marquee that one day I’d play with Twelfth Night on their first ever appearance in America I would have probably laughed in their face! It was a huge honour for me, and I feel very privileged to have played my own part, however small, in the long and esteemed history of the band. NEARfest was an absolute blast from the moment we all met up at Heathrow on Thursday to the moment we said our farewells the following Tuesday…. Andy Faulkner performed 2 gigs with Twelfth Night – the NEARFest warm-up show at the Peel (when the band was billed as “XII”) and NEARfest Apocalypse itself in June 2012.